The tetrode transistor is more commonly known today as a dual base transistor or a dual gate FET. By adding another base connection to a conventional triode transistor, two control elements are provided. This unique advantage offers a great deal of circuit simplicity in formerly complex semiconductor circuits. The tetrode transistor has been around for almost fifteen years but unfortunately has not attracted circuit designers as much as the more familiar triode transistor. Because of the current interest in the FET (field-effect transistor), investigation is being conducted into the unique advantages of this extra-element transistor and the circuit simplicity it affords. In this case, the exact equivalent circuit is difficult to illustrate. However, one manufacturer presents it as an ideal transistor with the base-to-base resistance as an ex­ternal component as shown in Fig. 1B, which could be better represented as illustrated in Fig. 1C. It is important to the working concept of the tetrode that the equivalent circuit representation show three facts. (1) The base-to-base resistance is a fixed ohmic resistance (except for larger than normal base currents). (2) The resistor divider action in the equivalent circuit is for a.c. only. (3) Most significant is the fact that the emitter and collector currents remain substantially constant for the entire range of minimum to maximum signal gain. While the latter is not true for the FET, the matter of the amount of signal modulation still holds true in essence. Fig. 1. (A) A tetrode transistor has two base connections. (B) and (C) Versions of the transistor equivalent circuit. Mechanically, the tetrode transistor is built as shown in Fig. 1A. It greatly resembles the conventional triode transistor, with the exception of a second base connection. Fig. 2. How base 2 applies a.g.c. to device. (A) With base 2 negative, base 1 controls electron flow. (B) With base 2 at zero volts, gain is about unity. (C) With base 2 positive, base 1 has very little influence on the electron flow. To further clarify this, we must examine the base layer of the bipolar tetrode in relation to the signal path and emitter-collector current. Fig. 2 demonstrates the way in which tetrode action is obtained and the means by which the base 2 voltage controls the signal gain of the transistor while the collector current remains substantially constant. In Fig. 2A, the arrows indicate the flow of electrons (in the case of the n-p-n tetrode) near the base 1 area of the base layer due to repulsion by the negatively charged base 2 end. This configuration represents the circuit under maximum gain conditions, with base 1 grounded for d.c. (common base) and the emitter grounded for a.c. (common emitter). Because of the resistance between the base connections, the base layer will have a maximum negative charge at the base 2 end, with the charge decreasing toward the base 1 end, so that in the narrowly confined area of base 1, the charge is all positive relative to both emitter and base 2. With such a charge, the emitted electrons are repelled by the negative base 2 charge and attracted by the positive base 1 charge. Under these conditions, all of the collector current (which is essentially all of the emitter current) flows through the base 1 region and is modulated by the incoming signal. As the negative base 2 voltage is decreased (toward zero voltage), less of the electrons are repelled by base 2, and at zero volts the electrons flow randomly across the entire emitter-base-collector junctions shown in Fig. 2B. When this occurs, only a small amount of current flows near base 1 and hence only a small amount of signal modulation appears at the collector. Such a condition might represent a gain of unity or less. If the base 2 voltage is allowed to reverse polarity and become positive by a small amount (relative to base 1) as shown in Fig. 2C, then the emitted electrons are repelled by the base 1 charge and essentially all of the current flows in the base 2 region. This state is minimum gain and actually represents attenuation of the incoming signal by 20 dB or more. It is interesting to note that the linearity of the base-to-base resistance is dependent to a large degree on the amount of emitter current as well as the level of the base-to-base current. Because the tetrode transistor is intended for small-signal applications only (and hence a small emitter current), the base-to-base resistance is normally used within its linear characteristics, and it is just these characteristics that lend themselves nicely to r.f. and i.f. circuitry. For the transistor, there is practically no change in collector current and hardly any change in base current; therefore, there is essentially no change in input capacitance or loading. Because of this, the response of the amplifier does not shift or skew as the stage gain is radically reduced. The Miller effect, commonly encountered in vacuum tubes, is thus eliminated. Since the total base 1 current is the sum of the base 1-emitter current and the base-to-base current, there is very little change in bias with an alteration in base 2 control voltage. Because of the isolation provided by the second base, the need for neutralization is greatly reduced in the tetrode. Since the nature of feedback is analogous in both tubes and transistors, similar methods of compensation are possible in either case. However, for tetrode transistor circuitry, it is only in rare cases that the maximum potentialities of a tetrode circuit can be improved solely through neutralization. The tetrode is useful only in small-signal applications, in most cases the application is at r.f. frequencies where convenience of the second base may be used to best advantage. Examples include a.g.c.-controlled i.f.. stages; converters where the second base becomes a separate injection element; r.f. signal generators with the output level controlled through the second base; and either an r.f. video attenuator, when used as a variable impedance directly across a line. While potential applications are unlimited, the familiar transmitter and receiver circuitry are easily adaptable to use of the tetrode, whether the transistor is bipolar or FET. At the present time, the only bipolar tetrodes available are the 3N34 and 3N35, both manufactured by Texas Instruments. However, the more recently introduced FET tetrodes are beginning to appear in greater numbers each month. 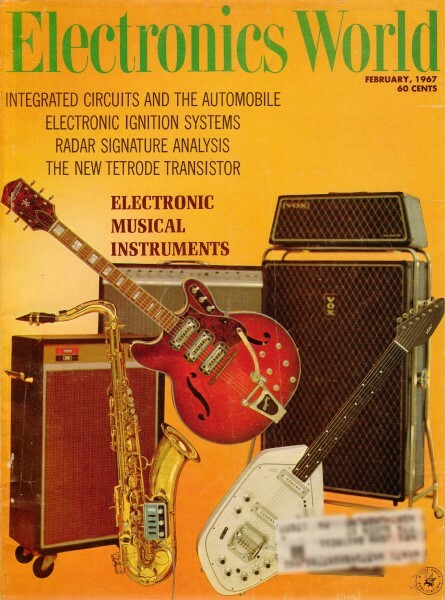 Nearly all the leading transistor (and also tube) manufacturers have tetrode FET's in their current transistor listings, There is also evidence that some companies are planning to produce pentode transistors by similar techniques. Fig. 3. 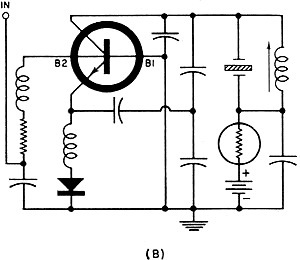 (A) Circuit using a single positive supply source. 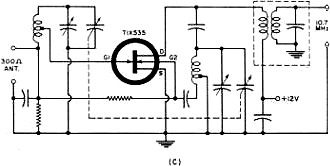 (B) Similar circuit uses dual voltage supply to provide grounded base 1 circuit. This simplifies r.f. grounding. Fig. 4. Circuit configurations for tetrode transistors. (A) FET 45-MHz i.f. amplifier shows how a.g.c. is applied. (B) A crystal-controlled FM oscillator. (C) Simplified autodyne converter uses both gates of FET transistor. The FET is operated in a manner that is similar to that of both the vacuum tube and the bipolar grown-junction tetrode, except for the aforementioned differences. 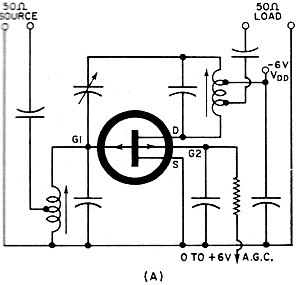 The bias may be derived from a divider where feasible, or a grounded-base (or gate) circuit may be used where preferable, as shown in Fig. 3. While the single supply of Fig. 3A is similar to that of the vacuum-tube circuit using a.g.c., it must be remembered that the separate base element of the transistor is used for that purpose. For high-frequency applications, it may be more desirable to return input circuits directly to ground, as shown in Fig. 3B, supplying negative bias to the emitter. This configuration is described as common base for d.c. and common emitter for r.f. (through the emitter bypass capacitance). The resistor-capacitor network in base 2 lead is used only as a filter. The a.g.c. voltage is usually derived from the detector circuit of a receiver, although in other types of equipment, it may be more elegant. Whatever the source, its prime purpose is to keep the output level of the stage or stages at a constant level over an extremely wide range of input levels. The bipolar transistor literature originally recommended a constant-current source for the second base, but it was found that the voltage source for the required base current could be controlled with a less complicated circuit, with more standard results from unit to unit. FET tetrodes require only a voltage source, with maximum gain occurring at zero volts on the second gate, at least for those elements used for a.g.c. action. All in all, the basic ideas used in either transistor or vacuum-tube a.g.c. are quite similar. The only precaution involved in the a.g.c. voltage is that it should be kept within the recommended limit, as breakdowns occur beyond this limit that can permanently damage the transistor. Fig. 4 shows a number of typical applications of the tetrode transistor. Fig. 4A, a 45-MHz amplifier using an FET, shows a gain of 20 dB and an approximate a.g.c. range of 40 dB for a change of zero to 6 volts on gate 2. This gate may be returned to a fixed voltage source of 6 volts through a potentiometer for manual gain, or it may be returned to ground or to base 1 for a fixed gain with no control. The crystal-controlled oscillator of Fig. 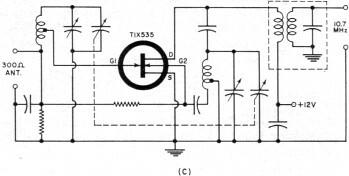 4B is frequency-modulated by applying a reverse a.c. current to base 2, thus causing a characteristic change in the output capacitance that shunts the crystal and tuned circuit. In a similar application with a v.f.o. (non-crystal controlled), a 250-kHz swing was achieved for a center frequency of 750 kHz for a base 2 current of 150 to 200 μA. An old favorite, the autodyne converter, has been modernized in Fig. 4C by using the two gates of an FET as separate injection elements for input and local oscillator signals. Because of the control action exerted by the introduction of the second base element, there is almost no limit to the variety of possible applications for tetrode transistors. Automatic level controlled generators, variable load impedances, a.f.c. circuits, and switch able r.f. amplifiers are only a few of those that have been successfully developed.